I’m normally not one for restaurant reviews. Typically, I wouldn’t even put myself into the category of fine dining connoisseur, let alone the finest-of-fine-dining connoisseur. However, today I’m making an exception. 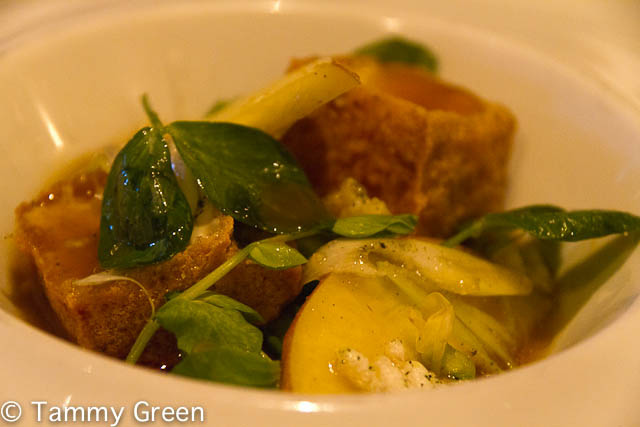 I couldn’t resist sharing my recent experience at one of the nicest restaurants I might ever set foot in: Charlie Trotter’s. 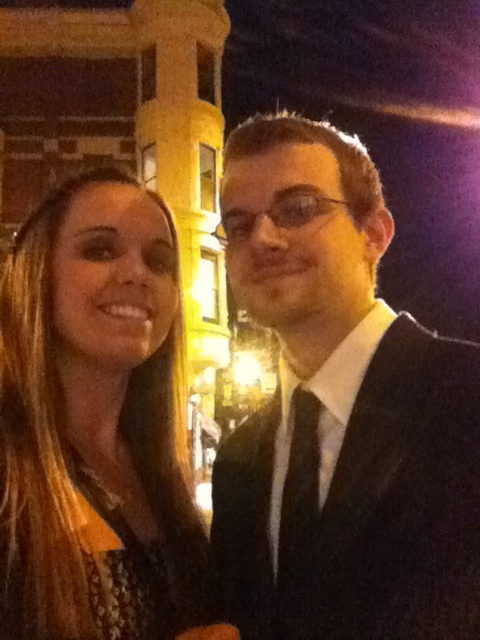 My Fiance and I have been wanting to go to Charlie Trotter’s for a while now. It’s something that we’ve wanted to do but had no push to actually make a reservation and go. When Charlie Trotter announced that he was going to be closing the restaurant to attend the University of Chicago to study Philosophy, we knew that our time was running out. With only a few weeks before the establishment would close its doors forever, Kenny and I made one of the only reservations we could get: 9:30 PM on a Tuesday. With a high price tag and even higher standard for fine culinary creations, I went into this dinner with extremely high expectations. I was not disappointed. When we arrived, I knew I was in for a treat. We were escorted up through three stories of small rooms, all of which looked like dining rooms pulled straight from a variety of French Tudor homes. Each room had a handfull of small tables, perfectly set with crystal stemware and white plates with Trotters signature ‘T’ in gold on the top. They took them away almost immediately after we sat down, but they did look lovely for their short stay. It wasn’t long before our gold “T” plates were replaced by plate after plate of tiny, delicious courses. Each course was so unique and completely different than any other taste I’d ever experienced. Each course paired perfectly with a variety of top-notch wines that made each course even better, which was hard to believe was possible. The waitstaff was absolutely delightful and their passion for food and providing legendary service radiated through the entire meal. They were knowledgeable and friendly and totally on their A-Game. It was an absolutely delightful evening! Charlie Trotter’s closed on August 31, so unfortunately, this review comes a little too late to allow you to get a reservation for yourself. However, I invite you to join me as I walk you through my dinner! 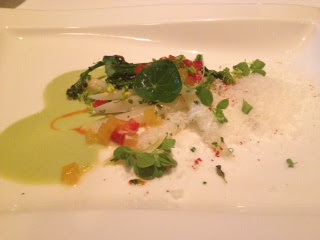 I had the vegetable menu and wine pairing. This was my favorite dish! 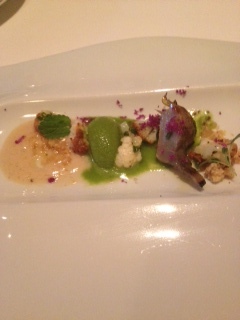 I don’t know if it was because I was so hungry or just so excited to try my first course, but I absolutely loved this. The first bite I had was the salty pine nuts with the avocado sorbet and it was just to die for. I didn’t love this dish. The peppers were almost the consistency of Jello and the asparagus kind of tasted like pasta. Kenny loved it though, so it was probably just me. Sadly, this was my least favorite, but it was certainly not bad by any means. This was the course I was least excited about when reading the menu, but it totally blew me away. I normally dont love tofu, so I was amazed by how much I loved this! It was crispy on the outside and the inside was so soft that it almost reminded me of pound caked. And with the peaches?! Loved it! I have never been more impressed with an egg. I couldn’t believe the consistency of it! The yolk and the white were almost the same texture. 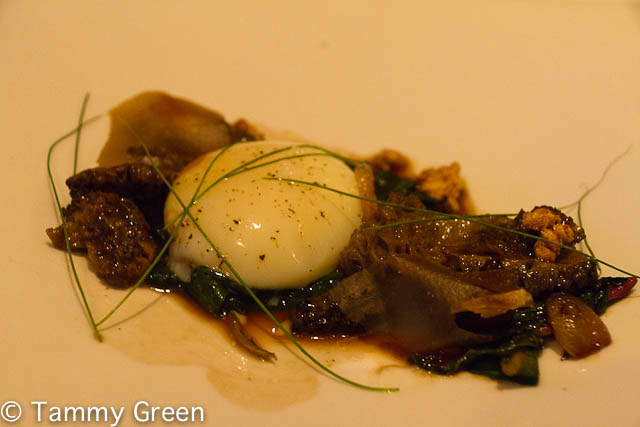 The white was soft and smooth and the yolk was just firm enough to hold its shape. It all just melted together in the most interesting way! I was really impressed. These little guys were very interesting! 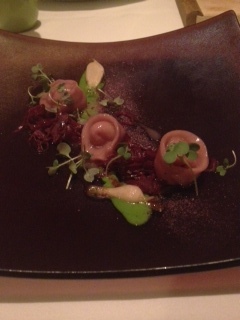 They were much firmer than I expected, which made them unlike any other tortellini I’d ever had. I liked them. Weren’t my favorite thing, but they were nice! I so badly wish I had a photo of this! This was my favorite of the dessert courses. It was exactly what it sounds like. This one lacked the strange complexity of a lot of the other courses, but more than made up for it with the burst of flavor in each element. It was simple, but just so delicious. The sorbet was so tart and sweet, and the shortbread was actually in crumb form so you got a little with every bite. Top notch. This one was … complicated. I think that’s the best way to describe it. I wasn’t quite sure how to eat it and what things I was supposed to eat together. I do know that the zucchini cake was super moist and delicious and that sauce with the seed things in it was amazing with it! 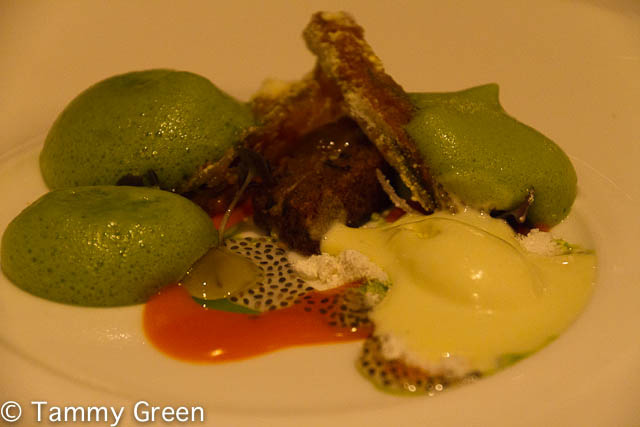 The whipped basil was kind of weird, but if you ate it with the olive oil sorbet, it was a great combination. There is no way for me to describe how amazing the root beer leaf ice cream was. It was just so good! It was almost minty, but with that sweet kick of root beer. Kenny and I were head over heals about it! It was such a great way to round out the evening! And by this point, we were so full that I sadly couldn’t finish the entire thing. I think I might have offended the server by not finishing it, but I was just out of room! NOTE: I would have loved to comment on the wine pairings as well, but I honestly know nothing about wine and I think I would just describe each of them as delicious. They were all great and perfectly matched with everything we ate. It was just such a great experience! Charlie Trotter himself made his way around the restaurant while we were there and it was really nice to see him interact with the guests. After dinner, our server took us down to kitchen, which was so cool and unexpected! The whole evening was just so perfect! Thank you so much, Mr. Trotter and best of luck in your future endeavors! If there was ever a class that changed my life, it was JOUR 480: Literary Feature Writing with Prof. Walt Harrington. It was an in-depth writing class that absolutely fascinated me. The class taught the art of this delightful medium of storytelling that reads like a literary piece while upholding journalistic standards of integrity and fact. This class taught me a lot of things, including how to ask tough questions, how to paint images with detail and how to find the story worth telling. My junior year of college, that story worth telling was about a very darling little girl and the amazing family that raised her. For the sake of the story, we’ll call her Sally. Sally had an older brother, a baby sister and two incredible parents who wanted nothing more than to raise three healthy, loving and happy children. They did just that. Sally just happened to have Down syndrome. I don’t think I saw anyone come within 10 feet of Sally without walking away with a smile. She was just a very strong and inspiring little girl. It was through my writing about this lovely family, that I ended up at at a very special organization that I feel so incredibly passionate about: Developmental Services Center (DSC). DSC is such a great organization that provides support to children and adults with disabilities in Champaign County. Their mission is to enhance the lives of individuals with disabilities by providing services and supports which enable them to live, work, learn and participate in their communities. The organization does so much good in their community that it gives me chills to just think about it. DSC is making a difference in people’s lives every single day. That’s just incredible to me. I was so impressed by DSC and what they did that I immediately reached out to see what I could do to help. I ended up with an AWESOME volunteer job in the development department. Working under two of the most inspiring, motivated and nice people I have ever met, I gained hands-on experience on the inner-workings of a non-profit organization. I spent my hours there helping with fundraisers, getting donations, working on spreadsheets and writing success stories about DSC consumers. I loved every minute of it. Why am I telling you this? Because DSC taught me the importance of doing good. Volunteering taught me what it means to do something because you genuinely care about it, not because you’re forced to. So my challenge to you is to find something that you care about and take a stand. Volunteer. Donate money. Run a 5K. Do whatever it takes to support what you care about. That is how you build character. You can find out more about DSC here. If you’re able, please consider donating to DSC as well. All proceeds go directly toward providing supports and services for people with disabilities in Champaign county. If it’s time that you have, please consider volunteering at DSC. There are lots of ways you can get involved that are listed here.